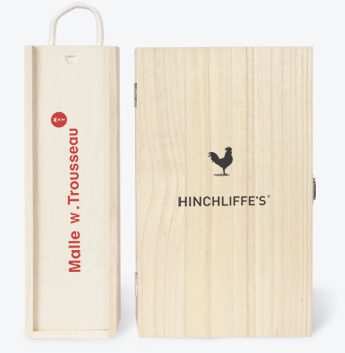 Our range of personalised wooden wine boxes and wooden hamper boxes are all made from quality FSC approved wood. Printing your logo onto wooden boxes can help you tap into the corporate gifting market and create lucrative lines of your own-brand luxury gifts . Whatever branded wooden box you’re looking for, our huge range offers the ultimate in wooden presentation boxes. Get in touch to start personalising your packaging today. Dictated by the size of the panel we are printing. Prices vary between products and include artworking charges and the cost of product itself. Separate printing lids are supplied for BW01/2/3 Prices are per unit for over-printing and based on approval of supplied artwork. Prices exclude the unit cost of the items. Print Colours: Our standard print colours are available without an extra charge; black, white, brown, gold and silver. All other colours are charged at £10 per colour. Size Change Charge: £10 charge will occur per change of box size where a variety of different sized boxes are being printed with the same size logo. Printing Costs do not count towards discounts or free delivery. Prices exclude the unit cost of the items. Print Colours: Our standard print colours are available without an extra charge; black, white, brown, gold and silver. All other colours are charged at £10 per colour. Size Change Charge: £10 charge will occur per change of box size where a variety of different sized boxes are being printed with the same size logo. Printing Costs do not count towards discounts or free delivery. Prices exclude the unit cost of the items. Size Change Charge: £20 charge will occur per change of box size where a variety of different sized boxes are being printed with the same size logo. Printing Costs do not count towards discounts or free delivery. No colour choice available. The logo is etched into the surface of the wood. Choose a plain stock product from our extensive range of wooden boxes, including sliding wooden wine boxes and luxury hinged boxes. Once approved, your product will be over-printed and delivered within 10 - 15 working days.